Training involves the reinforcement of a desired behavior. The various ways in which training is accomplished are described below. But an explanation of the types of "reinforcers" used is important before looking more closely at the training process. A "primary" reinforcer is one which is of intrinsic or direct value to the animal. An example of a primary reinforcer is food. A "secondary" reinforcer is one which the animal has learned is paired with an event where a primary reinforment was provided. An example of a secondary reinforcer is the action of a trainer or a sound produced by a trainer when a specific behavior is performed properly even though the primary reinforcer (such as food) is not provided. The most important part of any training program is the establishment of a bond of trust between the animal and the trainer. This is typically done through play sessions and feeding. Here this dolphin trusts me to be pulled using its dorsal fin (note I am holding the fin close to its point of attachment to the body to prevent injury to the animal). The trainer must be continuously looking for any behavioral signs which would indicate positive or negative responses to this training. Formal training of a calf is usually begun between 6 and 36 months of age. Such dorsal pulls, obviously, would not be done until the animal reaches mature size. Learning takes place in a series of steps. Learning by steps is called the “method of approximations”, or “incremental learning”, where the animal’s behavior is shaped when successive approximations of the desired behavior are appropriately reinforced. Dolphins are generally taught, first and foremost, to look above water at the trainer with both eyes. This behavior is called "stationing". When a dolphin sees a station signal such as a finger pointed upward, it translates to "look at the trainer, a signal or cue is coming." Training may occur when a dolphin performs a new behavior without being requested to do so. The behavior is always paired with the reward using a high-pitched whistle called a "bridge" (refer to the "Husbandry" chapter of this web site). It is called a bridge because it bridges or connects the behavior with the expectation for a reward. The trainer blows the bridge following the correctly performed behavior, indicating a reward should be expected and to "come and get it". Bridging at the moment of behavior completion is essential for the dolphin to associate it with the reward that follows. 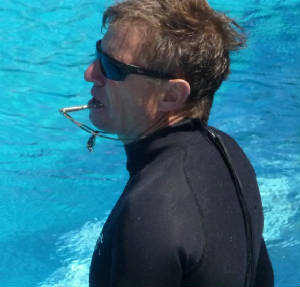 Using a device that the dolphin will hear allows the trainer to bridge at the proper time. At certain times bridging may not be appropriate, such as when a behavior is performed very close to the trainer. In these cases the trainer may lightly tap the animal on the head or "kiss" it on the rostrum. Such actions are called substitute-conditioned reinforcements. The reward should be varied so that its importance is not lessened when repeated. Behaviors are immediately bridged and reinforced so that they may likely occur again. Such "opportunistic" behaviors often occur between formal training sessions and must be carefully watched for by the trainer. Training sessions must be started and ended differently so that the sessions do not become "predictable", boring and demotivating to the dolphin. The first steps in approximations training may include the placement of an artificial target in the water. When the dolphin happens to touch the target with its rostrum, a reward is given as a reinforcement of this initially random behavior. Continued performance of this behavior becomes less and less random until it is a conditioned behavior, occurring each time the target is presented. The artificial target is then replaced with the trainer's hand. The intention of this replacement is to condition the dolphin to follow hand signals for all future requests to perform behaviors. An important part of training captive animals is to be able to call the animal to the trainer "on command". For a marine mammal such as the Atlantic Bottlenose Dolphin that command is a tap of the water with the open palm. The following video demonstrates that command. When training a dolphin, the specialist must condition the animal to accept different types of human touch. The animal is then rewarded for “not moving away” from this touch. 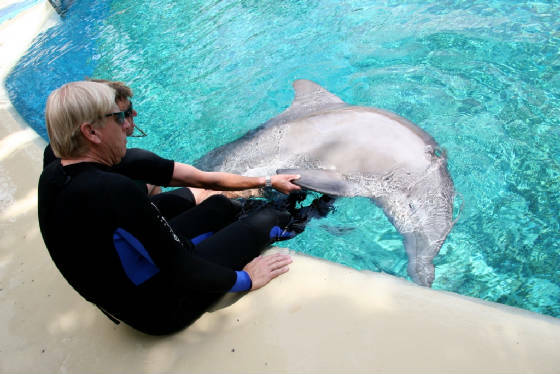 Training should be performed in an area with strong reinforcement history (such as a “feeding area”) to help relax the dolphin. Dolphins often develop a close relationship with specific trainers. 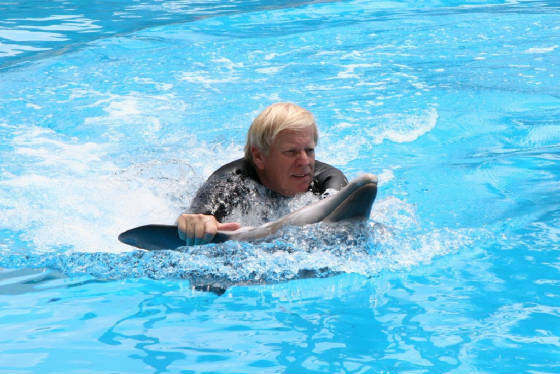 The relationship is based on the dolphin's trust of the trainer. 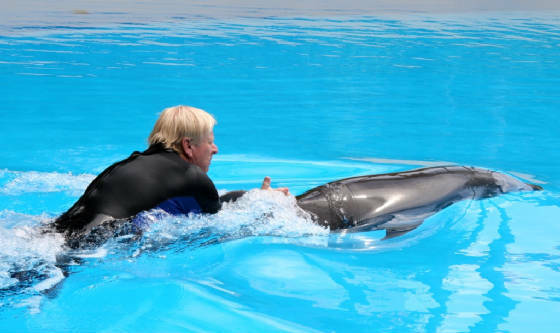 This makes it difficult, though, when other trainers attempt to work with this dolphin or when the trainer with the good relationship leaves for a position at another facility. Learning to “present” different parts of the body to the trainer is an important conditioned behavior, allowing examination and specimen collection to take place. The animal must be desensitized to contact, ambient noise, movement, etc. so that behavior conditioning can be the primary focus. Desensitization is a major part of a young dolphin's training regimen. 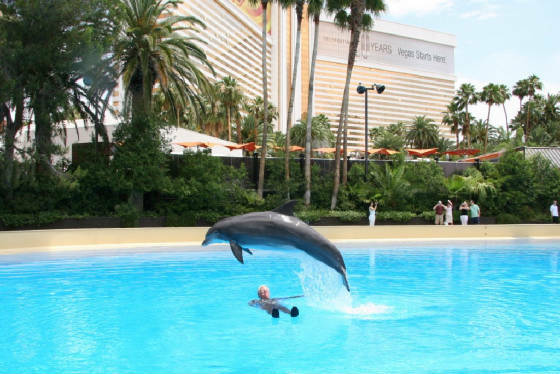 It may involve something as simple as the trainer bringing the animal poolside and placing his feet underneath the dolphin. As seen in this photo, a young animal may "tense up" and respond negatively to this situation. In this case, I was bitten twice in the foot by this young dolphin until he became used to my approach to him. 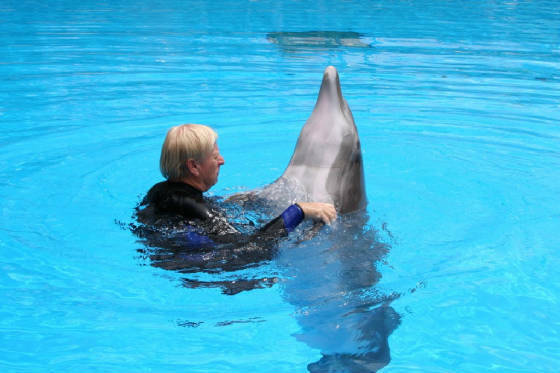 Once an acceptance of the trainer's desensitization is demonstrated by the dolphin, the acceptance is bridged and a reward is given. This process is repeated over and over to reinforce it. "Behavioral enrichment" is the practice of providing captive animals with environmental stimuli. This is done in an attempt to improve the animal's quality of life by increasing its physical activity, stimulating its natural behaviors and reducing boredom. Training sessions are one of the most critical forms of behavioral enrichment, but training is only a small part of the dolphin’s day. Other enrichments include the use of toys. In this video an 8 year old mother and her 7 month old female calf are seen playing with a beach ball. Using toys provides an activity more complex than just swimming in a pool. In this case a problem-solving activity is presented...how to get the ball off the pool's concrete apron. Mother and daughter show their success in solving this problem. 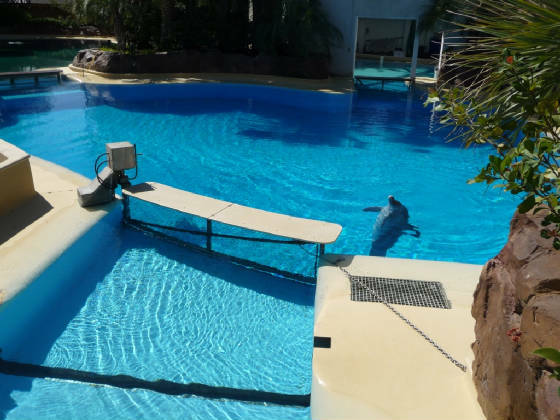 Other forms of enrichment include habitat changes (moving the dolphins from one pool to another) and public access to the animals. In the wild, dolphins have to work hard to catch their food. They also have to be concerned about their safety. In captivity, this is not the case. An important part of training and behavioral enrichment is providing captive dolphins with exercise. Enrichment provides the dolphin with an increased ability to adapt to changes in its environment, an important requirement for survival. Behavioral enrichment may be "invented" by the dolphin, just as children invent games to entertain themselves. Learning to make bubble rings has been observed in both captive and wild dolphins. It is a way in which the dolphin spends time creating and playing with "toys" they create out of air. The following video explains one way a dolphin makes bubble rings. Captive institutions must keep very careful and complete dolphin records. These records might include birth information, features of identification, medical history, progress made in the animal's training, mating episodes and offspring resulting from these episodes, specific personality traits observed, etc. Each dolphin is assigned a code number and its records are kept under that code number. The coding system is different from one institution to another. An example of a code number given to a dolphin might be: the first two letters of the dolphin's name, followed by its birth date (mm/dd/yyyy), followed by its gender (M or F). 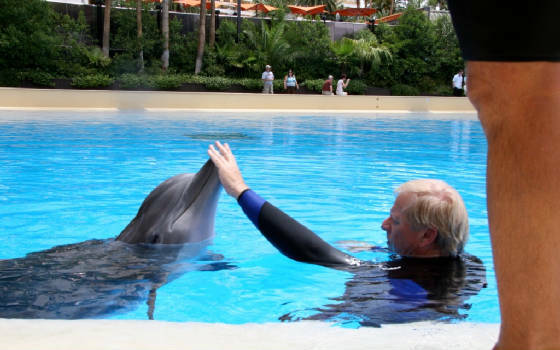 SO, YOU WANT TO BECOME A DOLPHIN TRAINER? Get a good background in life or marine science and/or behavioral psychology. A college degree in one or the other of these fields is almost a requirement these days. While you are in school volunteer at local zoos, aquariums or marine parks. With your volunteer experience and degree apply for an internship at one of the many schools or institutions offering such programs. Many are located in the southeastern U.S., California, Hawaii, and the Caribbean. These positions may last a few weeks or a few months. Possible internships may also exist with various government agencies such as the National Park Service or the Fish & Wildlife Division. Internship positions are often unpaid, but some may offer a small stipend. You will need to prove your interest and passion for this field to your potential employer so the more education and intern/volunteer experience you have, the better. Get SCUBA certified. Be in good physical shape because you will have to pass a rigorous physical exam in order to be considered for the better internship positions. Be ready for hard work. Much of the "grunt" work is done by the new interns before they are allowed to "graduate" to the more on-hands training activities. This means lifting, pulling, pushing, carrying, standing, walking and running. Be prepared to work outdoors. That means working in the cool months as well as in the hot ones. Training dolphins is not a nine-to-five job, as early hours and late hours will be required. Dolphins do not live on a nine-to-five clock. Be prepared to work weekends and holidays. Again, dolphins require care every day of the year and do not go on vacations, nor do they celebrate holidays. Be tolerant of the public. You will have to demonstrate good interpersonal skills when dealing with the enthusiastic, but uninformed and even sometimes abrasive public and their multitude of questions. The number of dolphin training positions is limited so expect the job market to be tough. Finally, don't plan on being rich. Entry level dolphin trainers make something slightly above minimum wage (say, $24,000.00 per year as of 2009). But advancement is possible and you could become a curator or administrator some day, making a decent salary. If you REALLY want to be a dolphin trainer, let none of what has been described stand in your way!! Try the following web sites for further information on becoming a dolphin trainer: www.ammpa.org (Alliance of Marine Parks and Aquariums), www.marine-ed.org (National Marine Educators Association), www.aza.org (Association of Zoos and Aquariums), and http://scilib.ucsd.edu/sio/guide/career.html (Careers in Oceanography Marine Science & Marine Biology).